Can you identify Tho Campbell named on this clock? Click on the images above to view them full size. The clock is probably from the early to mid 19th century when this type was in style. It is a typical 8-day weight driven movement with a white painted dial. The Hepplewhite case is a combination of mahogany and mahogany veneer with inlaid stringing. Some additional points about this clock and British clocks in general: I acquired this clock from someone who knew nothing about its background which is fairly typical. 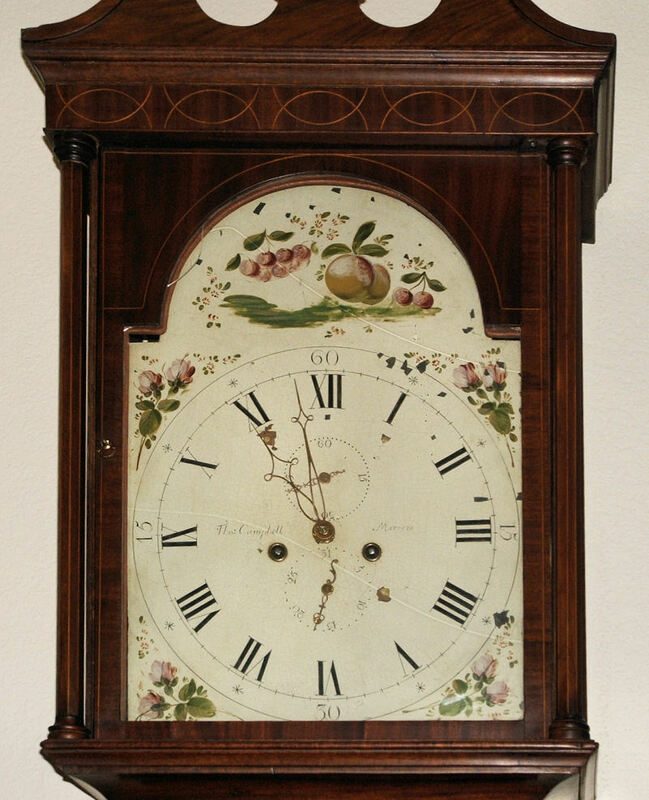 Many tall case clocks were imported to the US by antique dealers after WW II and sold to collectors for decoration. Information about ownership prior to that time is of course lost. Tho Campbell may not in fact be the maker of this clock as it was not unusual for a tradesman to have clocks made up with his name on them for sale in his retail establishment. This is well documented in clockmaking history. It may be worth while to see if there was a retail establishment operated by a Tho Campbell in the 1800 to 1850 period where I would date this clock by the style of the case. I have not provided any internal pictures of the clock since there are no markings on the movement or back of the dial and it's a typical 8 day bell strike movement of this period. Another clock by Maybole clockmaker Thomas Logan as found in Maine, USA in 2007. Read the story about Tho Logan and his clock.